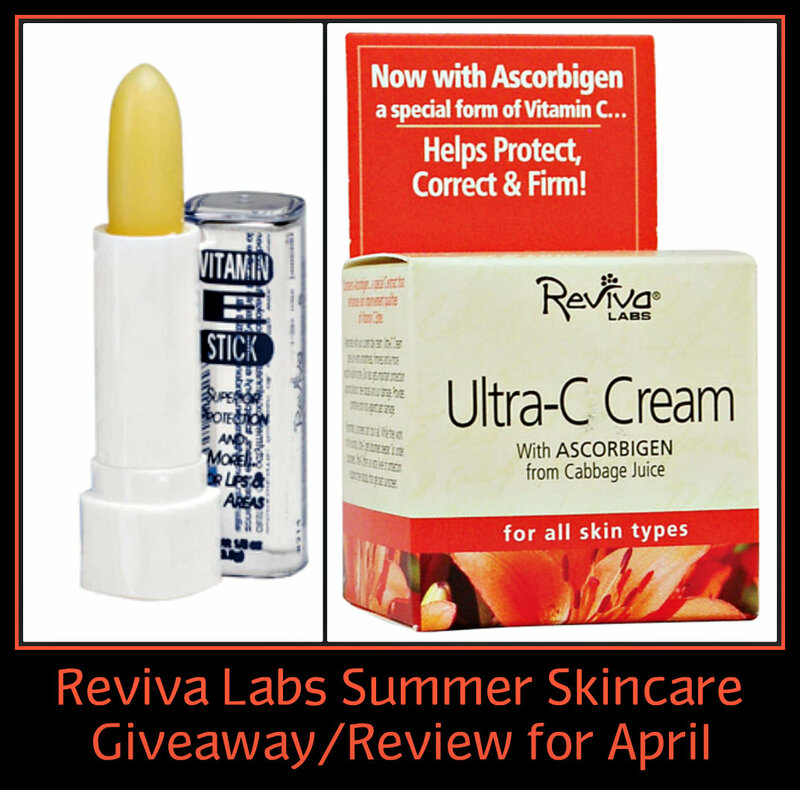 Reviva Labs is offering 6 months (April through September) of giveaways featuring products to enrich and protect your skin during the Summer season! 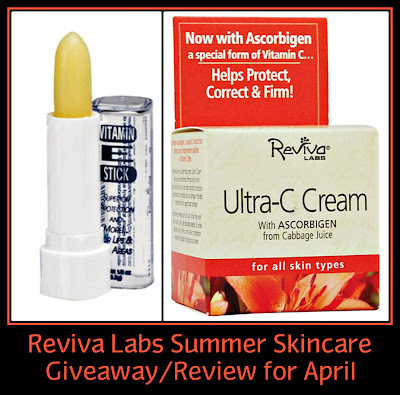 There are a number of blogs that are participating with Reviva Labs and their Summer Skincare Giveaway, so search them out and you can increase your chances of scoring some of these great products. Ultra-C Cream: I've been using this product as my daily moisturizer, and the directions suggest alternating it with your current creams. The idea of alternating this product is quite simple: your skin responds to various stimulants, including a variety of ingredients found in skin care products. I notice over time, some products that had been working wonders on my skin no longer have the same effect. Changing up my routine and using something different is often a good way to stimulate my skin. When I go back to a product that "used" to work, it seems to have a renewed effect of my skin. I apply a thin layer over my face and throat area, and then proceed to apply my makeup. It absorbs easily and leaves no greasy residue. In addition to smoothing and firming skin, the Ultra-C Cream provides an extra level of protection against sun damage. From Reviva Labs: Suncreens can't do it all. While they work on the surface, Ultra-C gets absorbed deeper. So under sunscreen, Ultra-C offers an extra level of protection--zapping free radicals that get past sunscreen. Ultra-C also provides corrective action against past damage." 1.5 oz. jar/$18.00. Ingredients: Demineralized Spring Water, Hydrogenated Vegetable Oil, Vegetable Oil, Glyceryl Stearate, Vitamin C Ester, Polysorbate 20, Cetyl Alcohol, Cetearyl Alcohol, Ceteareth-20, Lactic Acid, Tea Tree Oil, Ascorbigen, Hyaluronic Acid, Potassium Sorbate, Sodium Benzoate, Citric Acid, Simethicone, Essential Oils of White Flower & Orange Flower. Vitamin E Oil Stick: This little wonder stick provides a clear gloss on your lips that moisturizes and protects with an SPF 15 factor. It's never sticky, has little to no scent, and leaves your lips ultra-soft. It can also be used under the eye area for moisture and protection, and I've used it several times to moisturize my cuticles when I don't have a proper cuticle product handy. This is a product that I'm never without, and I always have a couple of tubes stashed away. It seems to melt right into my lips, and I find that it lasts longer than most lip balm protectants. 1/8 oz. swivel tube/$4.00. Ingredients: Soybean oil, candelilla wax, beeswax, castor oil, octylmethoxycinnamate, ozokerite, oxybenzone, cetyl esters, tocopheryl acetate (vitamin E), olive oil, allantoin, linden essential oil. Entry details: Prize package will be mailed directly from Reviva Labs, so all entrants must reside in the United States. Contest ends May 3 at 12:01 a.m. To enter, just leave a comment below and let me know what your biggest summertime skin care concerns are. Mine would be getting enough hydration and moisture for my skin after spending so much of my summer in the sun and at the beach! Also leave your eMail address so I can contact you if you are the winner. I had a Rafflecopter set up, but it wasn't working correctly and according to their Facebook page, they are experiencing issues. If you aren't comfortable sharing your eMail, be sure to check back on May 3 when I announce the winner, then you can contact me. *Products/prizes featured furnished by Reviva Labs. Stopping my nose from getting sunburned and peeling. I tend to get a little greasy in the hot Texas summers. Winters I'm dry and Summers I'm greasy... my skin can't make up it's mind! This creams are really a need during this summer. Glad to know it is pretty affordable. Keeping increased oil production at bay! It's a combination of sun worries and acne. I'm fairly pale, so I have to wear sunscreen, but the ones that don't break me out are all expensive. i worry about peeling :( and my skin dehydrating. the products that help me hydrate my skin are wayy too expensive. My biggest concern is dehydration and dryness. I live in the desert, so this is always a problem. My biggest concern is making sure I wear sunscreen, but I so easily forget!! I worry about finding that balance between moisturized skin and greasy skin. It gets super hot here in the summer! My skin is always dry! Both of these sound like they would work really well for my skin. Thanks for all of the hard work that you've put into your blog over the past few years! I'd have to say my biggest concern in the summer is avoiding greasy, shiny, oily skin. I've tried many products but none can defeat the oil that my skin produces. During a hot summer day I look like I dipped my face in a bucket of chicken grease lol. My children love to swiim so I am in the sun a lot. I am very concerned about sun damage and dryness from being in the sun. Although I try to slather myself up, I don't think it's enough. My number one concern is summer is sun protection for oily skin. No matter the age, the oil remains. My biggest concern for summer is making sure that I am wearing enough sun screen to prevent sun damage.